There was criticism in some Turkish papers of Prime Minister Recep Erdogan after he stormed off stage during a Davos debate, while Arab papers pointed out that he'd shown more support for Gaza over Israel's actions than Arab leaders. Three Turkish papers focused on the perceived inability of Erdogan to control his emotions and the damage that may have been done to Turkey's international standing. The latter theme was echoed in Israeli papers. Arab papers asked why the Arab League chief remained on the stage with the Israeli president, and more broadly highlighted what they saw as Arab leaders' failure to do more for Palestinians over the recent Gaza conflict. Our prime minister reprimanded the Israeli president in Davos... in an unimaginable way, at an international meeting, and before the eyes of millions of TV viewers. The entire world saw how Turkey was ruled by a politician who was not able to 'control his nerves'. 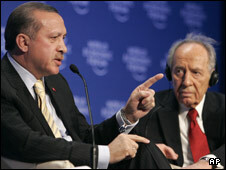 Turkey has never been so much at odds with the diplomatic practices of the international arena as much as yesterday... Yesterday's scandal has damaged our country's mediating role in regional conflicts. The efforts of the Foreign Ministry and other state institutions to calm down or put a brake on Erdogan have failed. Maybe he was stressed by the importance of the panel... Maybe it was the behaviour of Peres, which could be regarded as provocative. If it was, he achieved his aim. Erdogan, you exaggerated. There is more china crockery in your shop than in ours... If you want to become a European, start behaving like one, then maybe we'll see you in Davos again next year. The round of bloodshed in Gaza did no good to Erdogan's image. Not only was he perceived as friend of the aggressor, in the end he was not invited to the celebrations ending the war. We were not surprised to see the Turkish prime minister walking off the stage because he was not allowed to respond to Shimon Peres' misleading statements. We were surprised to see Arab League Secretary-General Amr Musa remaining on the same platform as Peres, without either challenging him or exposing his lies. Erdogan's action conveys many messages and could turn the whole international scene upside down. The important question now is: did the Arabs get the message? Erdogan proved once again that he is more Arab and human than most Arab rulers... Amr Musa's reaction was, in fact, a sin and absolutely astonishing.